Watch yourself grow in the Word with Andrew! Many people have become frustrated or even stopped reading the Bible due to a lack of understanding. If you’ve studied the Bible for any length of time, you’ve most likely come across certain verses that you found confusing. You might even have wished you could have a trusted Bible scholar like Andrew Wommack explain them to you. Well, now you can! 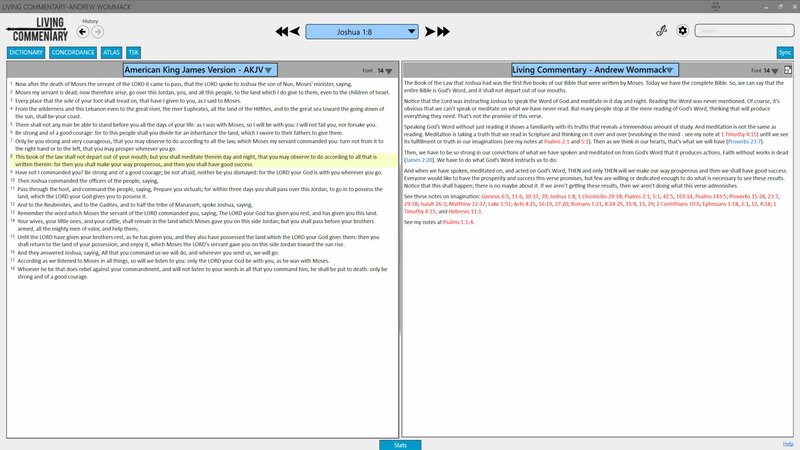 We’re pleased to announce the release of the latest version of Andrew’s Living Commentary! 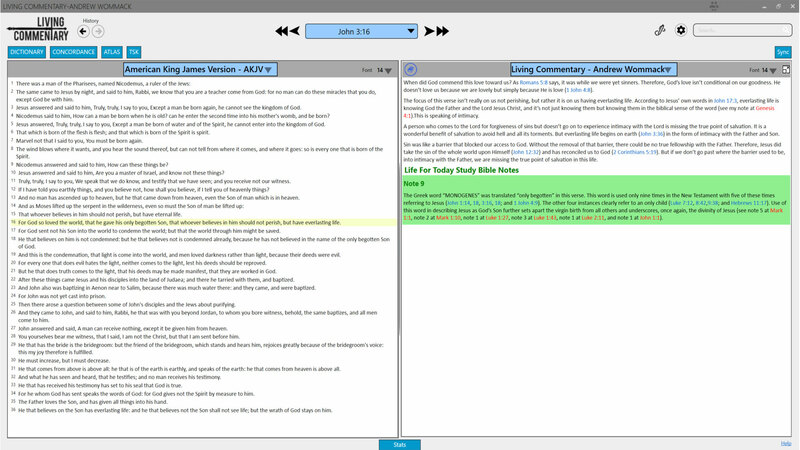 An excellent Bible study software that contains his notes on over 22,000 verses of the Bible, the Living Commentary is the most comprehensive accumulation of revelation the Lord has given Andrew over the last fifty years. Believers at all stages of maturity will gain a deeper revelation of the Word from a grace-and-faith perspective by using the Living Commentary. It connects the dots for anyone who’s ever questioned the Bible’s integrity or wondered how to defend their faith. Packed with new-and-improved features, the latest version makes Andrew’s updated notes available to you as soon as they’re completed—no more monthly updates! (It’s called “living” for a reason!) 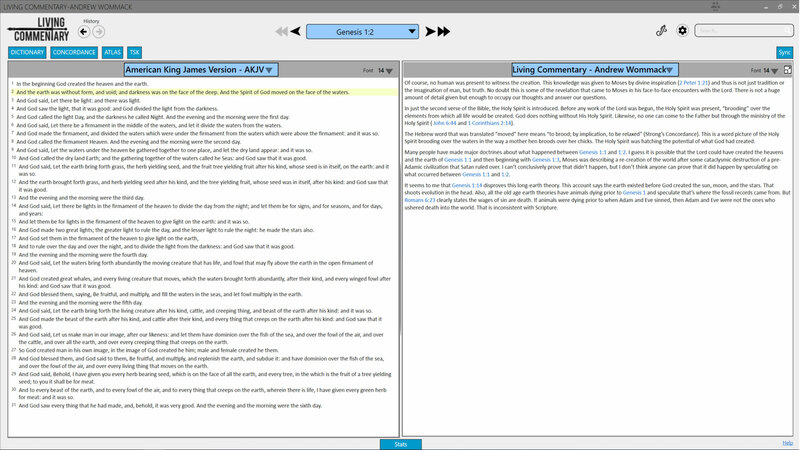 Also new to this version is the fact that the Living Commentary will no longer be hosted on the Wordsearch® Bible platform. As an independent application, it will serve your Bible study needs better. Minimum System Requirements: Windows 7, 8, or 10; Mac OS X 10.12 or greater. Currently not available for iPad, iPhone, Android or other mobile operating systems. Accessible on mobile smart devices via a web browser. Future support of Wordsearch version will be provided through Wordsearch Bible. All future updates to Andrew's notes will only be available in the new version. When you know the truth, it will set you free (John 8:32)! In the beginning God… The Scriptures don’t try to prove the existence of God. They begin with the truth that everyone knows there is a God. This is exactly the point of Romans 1:18-20. There is an intuitive knowledge of God on the inside of every single person who has ever lived. We shouldn’t argue with anyone about His existence. We just go past their heads to their hearts and touch the part of them that knows there is a God. God is the Alpha and Omega, the first and the last. He existed before anything else. He created everything else that exists. Some sci-fi fanatics try to present God as nothing but a superior alien, but that’s not what this scripture says. God doesn’t just have superior intellect and know how to use natural law more than we do. He is the Creator, not manipulator of nature. Of course, no human was present to witness the creation. This knowledge was given to Moses by divine inspiration (2 Peter 1:21) and thus is not just tradition or the imagination of man but truth. No doubt this is some of the revelation that came to Moses in his face-to-face encounters with the Lord. Not a huge amount of detail is given, but it’s enough to occupy our thoughts and answer our questions. In just the second verse of the Bible the Holy Spirit is introduced. Before any work of the Lord was begun, the Holy Spirit was present, “brooding” over the elements from which all life would be created. God does nothing without His Holy Spirit. Likewise, no one can come to the Father but through the ministry of the Holy Spirit (John 6:44 and 1 Corinthians 2:14). The Hebrew word that was translated “moved” in this verse means “to brood; by implication, to be relaxed” (Strong’s Concordance). This is a word picture of the Holy Spirit brooding over the waters in the way a mother hen broods over her chicks. The Holy Spirit was hatching the potential of what God had created. Many people have made major doctrines about what happened between Genesis 1:1 and 1:2. I guess it is possible that the Lord could have created the heavens and the earth of Genesis 1:1, and then beginning with Genesis 1:3, Moses might have been describing a re-creation of the world after some cataclysmic destruction of a pre-Adamic civilization that Satan ruled over. I can’t conclusively prove that didn’t happen, but I don’t think anyone can prove that did happen by speculating on what occurred between Genesis 1:1 and 1:2. It seems to me that Genesis 1:14 disproves this long earth theory. This account says the earth existed before God created the sun, moon, and stars. That shoots evolution in the head. God spoke everything into existence. Everything physical that we see was created by words. Words are the parent force and therefore, the greater force. Everything physical will respond to words, either positive or negative (Proverbs 18:20-21). Notice that God created light on the first day of creation. It wasn’t until the fourth day that He created the sun, moon, and stars (Genesis 1:14-19). So, there was light for four days before there was a source for that light. God is awesome! Darkness existed before light. The Lord didn’t create darkness (see my note at Isaiah 45:7). It is just the absence of light. It is the opposite of light. Once the Lord created light, He looked on the light, not the darkness. Likewise with us, once we receive the light, the Lord looks on the light He has created in us and doesn’t look at our darkness. He sees us in Christ. I don’t really understand how the Lord divided the light from the darkness. Today darkness is the absence of light. Once light comes, even if it is faint, there isn’t total darkness. So, how could He divide the light from the darkness? Is it possible that natural laws as we know them now are how He did this? Maybe light and darkness were able to be present side by side before He said this. The mention of evening before morning sets the precedent for the way the Jews reckoned a day. Sunset is the beginning of the Jewish day, and the next sunset is the end of that day. Technically, a day is one rotation of the earth. So, this account of the creation has the earth rotating from the beginning of creation, even before there was a sun to rise and set. See my notes at Genesis 1:3 and 14. This might sound like the firmament divided the oceans and seas from the water vapor in earth’s atmosphere. But in Genesis 1:14 God created the sun and stars and set them in the firmament. That clarifies that this firmament was the realm where all the stars exist. Therefore, there is water out there in the universe beyond the realm of the stars. This verse might indicate that the only water in the universe is on earth and then on the other side of the universe where heaven exists. If that is the meaning, then life as we know it on earth could not exist on any other planet without water. And God called the firmament Heaven. And the evening and the morning were the second day. And God said, Let the waters under the heaven be gathered together unto one place, and let the dry land appear: and it was so. The Jews reckoned a day from sunset to sunset as the wording of this chapter shows. See my note at Genesis 1:5. All the dry land on earth appeared in one day, which I believe was a twenty-four-hour day. That would put the kibosh on many of the theories of how the earth was formed. I have heard one scientist say that there is an isotope in granite that has a half-life of less than one second. That would mean that rock couldn’t have been formed over millions of years, as has been widely taught. It would’ve had to have been an instant creation, and this would fit perfectly with the apparent meaning of this verse. Notice only the waters under the heavens were gathered together. The water out in the far reaches of space, beyond the heavens, might still be dispersed. The wording of this verse is very important. If the Lord had just said, “Let there be grass and trees,” then when they died, there wouldn’t have been any new ones, and the Lord would have had to create more. But grasses and trees were created fully grown and with seeds to propagate the species. The original creation started from full-grown trees and grasses with seeds to continue the creation. Because of this, the Lord truly rested on the seventh day and has not had to create since (see my note at Genesis 2:2). Notice that the grasses and trees were brought forth from the earth. They weren’t just made to grow in the earth but were brought forth from the earth. They were already in the earth, and God just spoke for them to come forth. Compare with Genesis 1:26. Notice that the earth brought forth all these trees and grasses. It’s like God created within the earth all of the things that He later brought forth out of the earth. They were already there and just needed His word to come forth. If the natural creation had to have God’s Word to come forth, so do we. See my note at Genesis 1:5. This is really interesting. God created light on the first day of creation, but it wasn’t until the fourth day that He created the sun, moon, and stars. There was light three days before there was what we now know to be the source of light. Some say that original light came directly from God as will be the case in the new Jerusalem (Revelation 21:23; Revelation 22:5). But God and His glory existed in the beginning. It doesn’t seem like He needed to create that by saying, “Let there be light.” It would appear that the Lord created light three days before there was a source. God calls those things which be not as though they were (Romans 4:17). These lights were created to give light upon the earth. It would appear from this account that the earth was the focal point of God’s creation. This is the fourth day of creation. Yet, God created light on the first day (Genesis 1:3). So, there was light three days before there was a sun, a moon, or stars. The Hebrew word for “made” in this verse is “‘ASAH,” and it means “to do or make, in the broadest sense and widest application (as follows)” (Strong’s Concordance). It differs from the Hebrew word “BARA’,” which was translated “created” in Genesis 1:1. BARA’ means “to ‘create out of nothing’” (Vine’s Expository Dictionary), while ‘ASAH is speaking of forming or molding something from existing materials (see my note at Genesis 2:3). So, it appears that the materials for the sun, moon, and stars were created in the beginning, but they were only made and placed in their positions here on the fourth day of creation. Psalms 33:6 says all the hosts of heaven were created by the breath of His mouth. That means the sun, which scientists estimate to be about 109 times bigger than the earth, came out of His mouth. And our sun is one of the smaller suns. The temperature of our sun is supposed to be nearly 10,000 degrees Fahrenheit on its surface. All of this came out of God’s mouth. That same mouth gave us God’s Word. What a treasure! God set the sun, moon, and stars in their places. They weren’t just thrown out there indiscriminately. The moon is at just the right distance from the earth to control the ocean tides. The sun would kill us if it was closer, and we would freeze if it was farther away. God’s wisdom is perfect. Notice that the purpose of the sun, moon, and stars is to light the earth. The earth is the focal point of God’s creation because man is here. Just as with the trees and herbs springing forth from the land, it would appear that everything it took for these animals to be created was already in the seas and just needed to come forth at God’s word. Notice that all fowl were created from the sea. These animals didn’t have to be taught how to swim, fly, or reproduce. They were created with all of this knowledge in them, just as we see animals endowed with instinct today. If animals have all this information just intuitively in them, then certainly God placed intuitive knowledge inside all people (Romans 1:18-20). But man is so smart that they exalt their own opinions over the wisdom God placed inside of them. God’s blessing is always given by what He says. Through God’s words every living thing on earth was blessed with the ability to procreate. If this blessing isn’t manifesting in a person’s life, it can be remedied by speaking the blessing of God’s word over them. Notice that God spoke to all these animals. Is it therefore unreasonable to believe that they understood Him? Does that mean they can understand us? Just as with the grasses, trees (Genesis 1:11), and the animals in the sea (Genesis 1:20), God created all the land animals from the earth. These things came forth from the physical elements that already existed. But when God created man, He brought our spirits forth from Himself (Genesis 1:26). See my comments on “created” and “made” in my note at Genesis 1:16. Notice that God made all of these animals after their own kind. They didn’t all evolve from one kind and then become many different kinds. This disproves the theory of evolution for anyone who believes the Bible. Notice that when the Lord created the trees, grass, herbs, and animals, He said, “Let the earth bring forth” (Genesis 1:11 and 24). When He created all the animals in the sea, He said, “Let the waters bring forth” (Genesis 1:20). But when God made man, He said, “Let us” (this verse). Plants and animals came from the ground. Sea creatures and fowl came from the water. But mankind came from God Himself. Man was created last of all the creation of God. Thus everything was prepared for him in advance. He didn’t have to tread water for a few days until the dry land appeared, and he didn’t have to dodge trees and shrubs as they suddenly appeared. If God would have created man earlier, things wouldn’t have been ready for him. But man was created and then moved immediately into the rest of God where everything was complete. In all the rest of creation, God just spoke and told the waters to bring forth all the fish and fowls of the air. He told the earth to bring forth all the animals. But even though He used the dust of the earth to create man’s body, He was directly involved in the creation of man. Man was the crown jewel of His creation, and He took special care and created man in His likeness and image. Man was like God in many ways. One obvious likeness was that man was totally free to choose his course, as is God. He was made a free moral agent in every sense of the word. The best choice is to follow the will of the Lord, but God will protect man’s freedom of choice, even when that freedom brings suffering. The creation of angels is not detailed in Scripture, nor is the time of their creation given. We can be sure that the Lord didn’t create Satan. He created Lucifer, a godly angel (Isaiah 14 and Ezekiel 28), and in a very real sense, man made Satan when they transferred their God-given power and authority over to him (Romans 6:16). This account of the creation states that male and female were both created on the sixth day of creation. The account given in Genesis 2 might imply that a period of time longer than a day passed between the creation of Adam and the creation of Eve, but this verse would exclude that. Suffice it to say that Scripture doesn’t contradict itself. Moses wouldn’t have contradicted himself. Genesis 1 presents a broad view of creation, and Genesis 2 focuses on the creation of man, the animals, and Eve. It’s possible that just as the earth and the seas already had everything in them that it took to create the creatures and vegetation that came out of them, likewise, Adam may have had female in him, but Eve wasn’t separated from him until later, as recorded in Genesis 2:18-23. Is it possible that the Lord created male and female both in Adam in one day and then separated them into two people later on as detailed in Genesis 2? Notice that the Hebrew word “BARA” was used in this verse (translated “created”) and that the word “ASAH” was used in the previous verse to speak of God making man (see my note on these Hebrew words at Genesis 1:16). It’s appropriate to say that man was made and created. His body was formed from the dust of the earth, and his spirit was created in the likeness of God. Much has been made out of the word “replenish” in this verse. It’s been said that this is referring to the fact that the world had been populated before and then destroyed, and had to be replenished. But the Hebrew word “MALE’,” translated “replenish” here, means “to fill or (intransitively) be full of, in a wide application (literally and figuratively)” (Strong’s Concordance). It does not convey the meaning of refilling, as some have tried to make it say. This faulty understanding of what the word “replenish” means is at the heart of all the teaching based on a pre-Adamic civilization. Therefore, I don’t think that teaching is correct. This verse gives mankind a God-given mandate to subdue and dominate every living thing on the earth. Later, God placed a fear of man in every animal (Genesis 9:2). Man was created to be vegetarian. However, the Scripture clearly teaches in 1 Timothy 4:1-5 that it is a doctrine of devils to preach that we should not eat meat. In Genesis 9:3, the Lord told Noah and his family that He had given them the beasts of the field for meat. Originally all of the animals God created were vegetarians. That has since changed. To say that God’s creation was “very good” seems like a gross understatement. It was and is awesome! See 2 Samuel 22:31 and Psalms 18:30. The Greek word from which “sundry times” was translated is POLUMEROS. According to Strong’s, it means “in many portions, i.e. variously as to time and agency (piecemeal).” In other words, the way God communicated with people under the Old Covenant was incomplete and sporadic. But in contrast, the Father has now revealed Himself perfectly through His Son, Jesus, in the New Covenant. The revelation of the Father through Jesus is far superior than the Old Covenant revelation of God. The Old Covenant wasn’t inaccurate. It was incomplete. We have a better revelation. Jesus is the heir to all that God has and is, and we are joint heirs with Him (Romans 8:17). Isaiah 42:8 says the Lord will not share His glory with another. Therefore, Jesus is the Lord. What a great testament to the deity of Jesus. The Greek word “CHARAKTER,” from which “express image” was translated, was defined by Strong’s Concordance as “a graver (the tool or the person), i.e. (by implication) engraving ((‘character’), the figure stamped, i.e. an exact copy or (figuratively) representation).” Jesus was exactly like His Father. He was an exact copy. He perfectly represented God to us. If we look at Jesus, we are looking at the Father (John 14:9). Colossians 1:17 says that “by him all things consist.” Jesus holds creation together. If He were to break His Word (the Word that created the universe, John 1:3), the universe would fly apart. Since creation is still intact, we can be assured that He has never failed to keep His Word. God’s Word is the binding power that holds all creation together. So when we speak God’s Word in faith, that power is released. After Jesus purged us of our sins, He sat down on the right hand of the Father. The significance of this is that He doesn’t still have to cleanse us. He’s seated. It’s finished. Jesus doesn’t have to continually purge us from sin every time we sin. It was done once for all time (Hebrews 10:10-14). We were forgiven of all sin: past-, present-, and even future-tense sin (Hebrews 9:12 and 25-28). The purpose of the book of Hebrews is to establish that Jesus supersedes all other beings and revelations of God. It is to prove that we have a better covenant than the Old Covenant and move the readers from the old to the new. Hebrews 1 shows that Jesus is greater than any angel. He created the angels (John 1:3 and Colossians 1:16-17). He is God’s Son and, therefore, God’s heir. He has a greater power and authority than the angels by inheritance. This is a quotation from Psalms 2:7–”…Thou art my Son; this day have I begotten thee.” This was also quoted in Acts 13:33 and applied in a way that reveals that the day in which Jesus was begotten was the day of His resurrection from the dead. The latter part of this verse quotes 2 Samuel 7:14, 1 Chronicles 17:13, and 1 Chronicles 22:10. All of these verses are promises to the seed of David that God will be their Father and he will be God’s Son. From Galatians 3:16, we see that the seed of David is Christ. The point the writer of Hebrews is making is that the O.T. statements about Jesus elevate Him to a position higher than any angel. Therefore, the word of Jesus is greater than the word of any angel. God commanded the angels to worship Jesus at His birth (Luke 2:13). This proves that Jesus is superior to the angels. They would not worship an equal but a greater. The Jehovah’s Witness organization preaches that Jesus was an angel, specifically the O.T. Michael, the archangel. Therefore, they don’t believe Jesus was God but an angelic created being. This is heresy, which denies the deity of Jesus. This is totally against what these scriptures are presenting here. This verse quotes Psalms 104:4. It is saying Jesus created the angels; therefore, the Creator has to be superior to His creation. This is quoting Psalms 45:6, which says, “Thy throne, O God, is for ever and ever: the sceptre of thy kingdom is a right sceptre.” God the Father is referring to Jesus as God. This is conclusive proof of the deity of the Lord Jesus Christ. Notice also in Psalms 45:7 that the Lord anointed Jesus with the oil of gladness above all His fellows. That means Jesus was the happiest man on the earth. He was a man of sorrows and acquainted with grief (Isaiah 53:3), but He was also happier than anyone else. Religion has obstructed this view of Jesus, and therefore has produced a lot of sad Christians. In Hebrews 1:2, the writer said God the Father created all things by Jesus. So, it was Jesus that laid the foundation of the earth, and the works of the heavens are the works of Jesus’ hands. Jesus was not just a man. He was God manifest in the flesh, and now He is God in a glorified body. This verse is continuing to speak of Jesus. Jesus will outlast His creation. If He will outlast the heavens, then certainly He is more than a man or angel. He is God manifest in the flesh. Jesus is the One who created the heavens and the earth, and He will be the One to destroy them. Therefore, He is superior to creation and all created beings, including angels. This is a quotation from Psalms 110:1, which says, “The Lord said unto my Lord, Sit thou at my right hand, until I make thine enemies thy footstool.” Here again is one Lord (God the Father) speaking to another Lord (Jesus) to sit at His (the Father’s) right hand. The point is that Jesus was not just an angel. He is the Son of God, God in the flesh, and a part of the Godhead. All angels are commissioned by God to minister to those who SHALL BE heirs of salvation. This means that the angels’ assignment to us doesn’t start after we get saved. They are ministering to us even in our lost state, because the Lord knows we SHALL BECOME followers of the Lord Jesus Christ. Thank You, Jesus!